Today, Cron play very vital role in our website. It reduce the lots of manual work like update the record, Caching the pages, Remove not-required data etc. If there are too-many cron jobs in our web application that its hard to manage the cron jobs through crontabs. Also sometimes Compmay Owner/Manger wants to mange the cron jobs through the Admin Panel. Here is sample code with use of which you can mange the cron jobs from PHP. 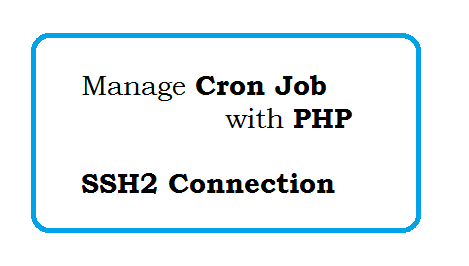 Now you can add/update/delete the cron job from PHP. linux Interview Questions and Answers for freshers and experienced. How to add user in linux terminal OR change the password of user..
Linux Access logs - List of Columns - Simple commands to view Server Logs.